When The Walls Come Tumbling Down On Charlie Crist. Charlie Crist is about to get up close and personal with those lyrics. We thought it would be his association with Scott Rothstein, the imprisoned Ponzi-schemer who alleges that Charlie Crist traded Judgeships for cold, hard, cash. I’m still wondering if an indictment is forthcoming in that case. Jim Greer, the former Florida GOP chair has now come out with a book that he says will blow the lid off of Florida Politics and give us an inside look on what has gone on in the Florida GOP. Greer says he was framed and didn’t steal funds from the party. He is angry and is ready to tell his side of the story. when the public finds out what some of the political leaders of the state are really like, the public will be disgusted. He predicts the book will derail Charlie Crist’s gubernatorial bid. 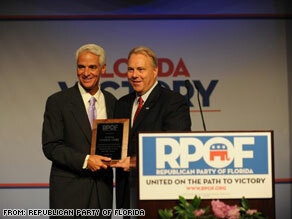 Does anyone other than me seem to notice that Charlie Crist is always surround by criminals? Where there is smoke, there has to be fire. I know Crisco Crist is greasy, but will he keep sliding away from the illegal activities that seem to always surround him and his friends? The book, The Chairman: The Rise and Betrayal of Jim Greer, is already being advertised online and will paint a negative picture of many top of the state’s politicians from Charlie Crist to Marco Rubio. Greer says he saw it all when he was running the Republican Party of Florida. Someone is shaking in his boots! The Florida Democrats need to think long and hard, as to whether they want to hook themselves to Chain-Gang Charlie. I’m sure we haven’t begun to even see the TIP of this iceberg. Charlie Crist is a train-wreck waiting to happen, and the Florida Democratic Party is going to get caught up in it, unless they wake up and get behind the only true democrat in the race, Nan Rich. I just noticed that I have that exact painting hanging above that mantle!! LOL!! Jennifer Carol is also releasing a tell-all book in the near future.